In honor of today, Tax Day 2018, here is a harvest of new/old image/word art-i-facts which hopefully will aid in bucking the bucket of the beast of burden behind the bear and bull b.s. Although WWII officially “ended” early on in the Truman presidency, the hot wind of detonation immediately blew open the door to the “Cold War“–a stale standoff between countries with billion dollar nuclear weapons which, like the “War on Terror” (a justification being suspected nuclear weapons in the hands of the “Axis of evil“, and by which, since its inception in 2001, has cost each American taxpayer $24,000 (fpif.org)), is ongoing to this day. With this orthodox history known and with occult history–such as the fact that U.S. banks funded the Nazis (washingtonsblog.com)–coming to light, its clear and cold that the buck didn’t stop. Inflations of Bureaucracy / 2018 / paint on balsa wood structure / on the desk of C.E. Since the original sign retired at the end of Truman’s presidency in 1953 (it now exists on display at the trumanlibrary.org), there has arguably been significant buck stopping/starting passing over the subsequent Presidents’ desks. Honestly, I got tired of there not being an updated sign on the current President’s desk as a statement of his intentions. And so to trump the President in his own game, I decided to make the sign before he could, and put it on my own desk. Because, after all, the buck starts with me/you, right? Mundanely, this functional sculpture is a three-tier balsa wood paper holder which I purchased at my local Ben Franklin craft supply store for $9.96, and subsequently painted brown and gold. I took the idea of the form of Truman’s rudimentary sign one or more steps further as a functional paper holder (for all that e-file tax paperwork! ), making the statement greater and greater again (third times a charm!). Impractically speaking, there are more than three layers to its statement. For one, it demonstrates, in an ever-increasing inflation of meaningless words, the true nature of the beast behind buck stopping in America. Does the buck stop here? Because, as history has it, like the bear and the bull, the buck isn’t stopping–here, there, or anywhere. In fact, it keeps going–faster and faster, or more and more. As the tyrannical and head-hungry Red Queen in Lewis Carrol’s Through the Looking-Glass states, “it takes all the running you can do, to keep in the same place. If you want to get somewhere else, you must run at least twice as fast as that!” (wikipedia). That is certainly a challenge! Although the 45th POTUS, Donald J. Trump, doesn’t (yet) have a nifty sign for his desk, he did issue a personalized Presidential Challenge Coin on the winter solstice of 2017, which I wrote about here. As this “coin” (i.e. alternate form of buck) is mainly a symbolic talisman, it is monetarily worthless. It can be bought and sold (as a collector’s item), but it cannot do the buying or selling. So in this (non)sense, this is truly some buck stopping! But where did the buck begin? NOTE: “bucks” as we know them (i.e. dollar bills i.e. “money”) are/is NOT created by the American government (i.e. the democracy). The paper tender that we tenderly think of as “money” is a creation of the Federal Reserve System–aka the central banking system–which essentially revolves around a grouping of large, privately-owned banks. These corporations oversee–among many other things–the issuing of these “federal reserve notes”, just like how money grows on trees. For example, according to wikipedia, the U.S. Treasury “sold” (in passing, perhaps?) 6.66 billion newly printed notes in 2013 to the Federal Reserve, which then issued the notes–for an interesting fee, of course–to smaller financial institutions (i.e. your personal bank). And through a series of your labor-exhange-for-money endeavors (i.e. jobs) on behalf of the American economy (God Bless America), you generate, among many things: income tax. Then, at the end of the day, the Federal government can *potentially* pay back the Federal Reserve for all the money it has “borrowed” in the form of these “federal reserve notes”, which–as of June 5th 1933, when the FDR (Franklin Delano Roosevelt, or FeDeRal Reserve?) administration took the U.S. economy off the gold standard (history.com)–is not backed by silver, gold, or anything tangible at all. Cash in your cash and maybe you’ll get…a buck-et of hot air! So…would this making passing the fiat a good thing? According to gobankingrates.com, the U.S. is expected to bring in 3.5 trillion dollars in tax revenue this year. So the next question is: Where is that alleged 3.5 trillion dollars being passed to? And are the bucks running fast enough, as the Red Queen would have it? Although $3.5 trillion sounds like tons of “money”, the Federal Spending Budget (this year named “America First: A Budget Blueprint to Make America Great Again“) averages out around 4 trillion dollars. This means there will be a national deficit of about $440 billion–a decrease in deficit from the $666 billion (wikipedia) which accrued at the end of the 2017 fiscal year, which began at the end of Obama’s final term in 2016. This new deficit will *in theory* be achieved through spending cuts across the American frontier. It seems the only arenas which will have more bucks passing into them are the Department of Veteran Affairs, the Department of Homeland Security, and the Defense Department (washingtonpost.com). Though I am no economist, it’s quite astounding to me that historically, government officials have proven themselves to be totally inept at balancing a budget. However, I *suspect* that this probably has to do with the fact that a balanced budget would not finance greater agendas at play. 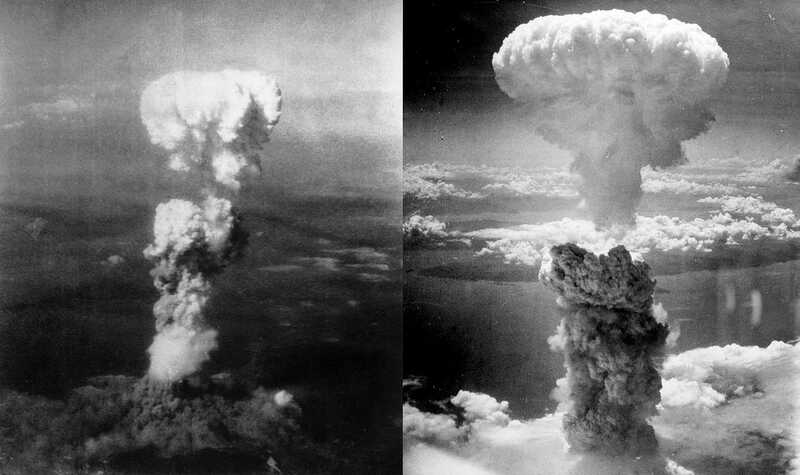 Photographs of “little boy” and “fat man” dropped on Hiroshima and Nagasaki. The creation of these bombs under the Manhattan Project was estimated to cost about $2 billion in 1945. This would be $25 billion in 2008 (whatitcosts.com), and according to an online inflation calculation, around $28 billion today. Image: businessinsider.com. Back in the real world, as usual I filed my taxes via an H&R Block program. This year, at the end of the filing, it gave me the option to dump some or all of my $333 into the Amazon. If I applied the full amount, the 5% “refund bonus” (is that supposed to be a double positive?) I would receive would be $16.66–so I declined. I still wonder, however: if I had accepted the offer, would I have found out why the Fed wants me to spend their $$$ on Amazon .com? So aside from our tax returns possibly going back into amazon .com, where are our tax dollars running twice as fast to? The same US Debt Clock a full 3 minutes later. Hooray, we’re winning the race running up those numbers really fast on the U.S. Debt Clock on Tax Day 2018! But remember: The President assured us in his State of the Union Address (which I wrote about here) that the average American household will get an increase of $4000 in take-home pay–which is “a lot of money”. I suppose this is made possible by (i.e. sponsored by) spending cuts in conjunction with Homeland Security and the D.O.D.? And when is the Fed gonna get real and start issuing zero dollar bills? Although the market goes up and down, one thing that is always up (unless you yourself are upside down) is the sky. And since the start of the “Great Recession” in 2008, there have been some interesting progressions in the astrological celestial sphere. To reference a few significant highlights with some links to further research: in January of 2008, Pluto entered the sign of Capricorn. The last time this occurred was between 1762-1778, when the United States was founded. Pluto in Capricorn strongly influences transformation within the realms of government and economics, as can be read about more in-depth here. Symbolically, Capricorn appears as a half-goat half-fish beast, while Pluto, (not actually having a representative beast) could be depicted as the phoenix of planets (sorry GWB, but it’s a planet). It will remain in Capricorn until 2024. Pluto’s energies are also being amplified and grounded by the transiting of Saturn–the law maker and task master–which entered Capricorn on December 20th, 2017, within which it will remain into 2020 (further reading on that here). To bring it back to the bull: starting May 15th, 2018, Uranus will enter the sign of Taurus, after having been cruising in Aries for the past 8 years. The last time Uranus was in Taurus was from 1934-1942. The astrological sign of Taurus, represented by the bull, is the sign of finance, while Uranus is the planet of revolution (the chemistry of which can be read about here). A hint at figuring out the significance of transiting planets in the Zodiac: what happened last time may come around again this time–but never in the exact same way (this has something to do with “history repeats itself”). Whether the buck is stopped or passed, or something in between, what goes around comes around. The Greatest Seal (detail) / 2018 / acrylic on canvas / 40″x40″ / by C.E.